My eighteen year old daughter, Sarah, has always loved to fish. From the time she was a four year-old holding her snoopy pole out on the end of the dock to the present day, she had enjoyed the excitement that fishing brings to life. I don’t know what I did right to instill her love of angling, but she has fished virtually every year of her life since that first outing in 1999. She has fished in five different states and has caught walleye, perch, crappie, blue gill, trout, bass, northern pike, and even the mighty muskie. As the summer has slipped away, Sarah kept lamenting about how she would like to go fishing. She is scheduled to start school at the University of Minnesota in September, so time was running out. Much of her summer was spent working twenty hours a week at the grocery store near us trying to save money for college. I was busy myself, working full time as well as promoting my book. Because I rely on my fishing buddy Steve to get us out on the water with his boat we struggled to find a weekend that would work for all three of us. Eventually it worked out that we could all fish this past Saturday, August 16th so we chose Browns Lake near Burlington, as our spot and hoped for good weather. I woke Sarah up at 5:30 and we were on the road by 5:45. She is not one to argue with getting up early if it means fishing. Most teens would choose sleeping in any day versus sitting in a boat with two adult males bantering amongst themselves. This was her chance though and she didn't want to miss it. We got onto the lake about 6:30 and because Steve's first choice for fishing spots was taken, he motored us to another known hot spot. After about four casts with my green and yellow spinner bait, I managed to pull in a small northern. It's always good for the fishing party morale to get that first fish in the boat. It is a good start to the day and takes the edge off of the pressure to not get skunked. While it was nice that I got a fish, I really wanted Sarah to catch one and, eventually, many more. After a few more casts, knowing that this lure was successful, I switched rods with her. Wouldn't you know she'd catch a nice northern on her first cast with the lucky lure? It was epic. 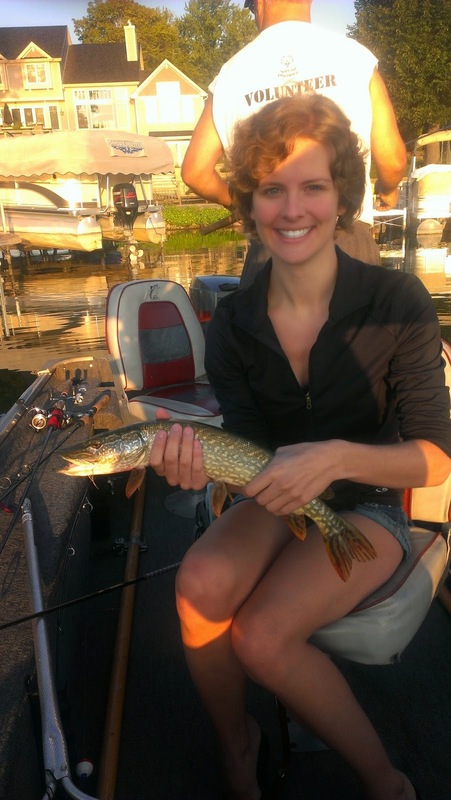 The fish was no great shakes, but I'll be darned if it wasn't exactly what she wanted, a northern pike. Over the course of the morning, Steve managed to catch his fair share of fish too, including a really nice largemouth bass. When the sun got too warm, the bite dropped off and we decided to head in. When it was over, I looked back on what will be a memorable day for me. It was, essentially, Sarah's first time fishing as an 18 year old adult, and her last time fishing before the new chapter of college. She mentioned that she hoped her uncles and cousins will take her fishing in Minnesota while she's up there and I don't think she'll have any problem with that. It was also special for Steve, who has known Sarah her whole life. He loves to help people catch fish. He was there when both her and I caught our first muskies. What he might not realize was he helped her satisfy her fishing bug for the summer and created a great memory for her and her dad as well. He's a good friend and a heck of an uncle.